Dr. Gerald E. Galloway, Jr. is a member of the Center for Climate and Security’s Advisory Board, and Glenn L. Martin Institute Professor of Engineering, Department of Civil and Environmental Engineering and an Affiliate Professor, School of Public Policy, University of Maryland, College Park, Maryland, where his focus is on water resources policy and management. He is also a Visiting Scholar at the US Army Corps of Engineers Institute for Water Resources. He joined the faculty of the University of Maryland following a 38 year career in the U.S. Army, retiring as Brigadier General, and served eight additional years in the federal government, most of which was associated with water resources management. He served for three years as District Engineer for the USACE in Vicksburg, MS and later, for seven years as a Presidential appointee to the Mississippi River Commission. 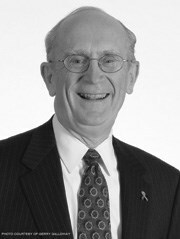 Professor Galloway is the former Dean of the faculty and academic programs at the Industrial College of the Armed Forces, and former Dean of the academic board, United States Military Academy at West Point where he was also a professor of geography and the first head of the Department of Geography and Environmental Engineering. In 1993 and 1994 he was assigned to the White House to lead an interagency study of the causes of the Great Mississippi River Flood of 1993 and to make recommendations concerning the nation’s floodplain management program. Dr. Galloway was elected to the National Academy of Engineering in 2004 for distinguished leadership in the management of sustainable water resources and education in environmental engineering. He has been a member of nine National Academies committees studying complex water resources and geospatial management issues including U.S. ocean research science and technology priorities, river science activities of the US Geological Survey, FEMA Flood Maps: Accuracy Assessment and Cost-Effective Improvements, and was chair of a National Academies committee studying logistics support for the future US Army. He has also been a member of the National Research Council’s Water Science and Technology Board. He holds a Master’s degree in Engineering from Princeton; a Master’s in Public Administration from Penn State (Capitol Campus), a Master’s in Military Art and Science from the US Army Command and General Staff College and a Ph.D. in Geography (Water Resources) from the University of North Carolina (Chapel Hill).